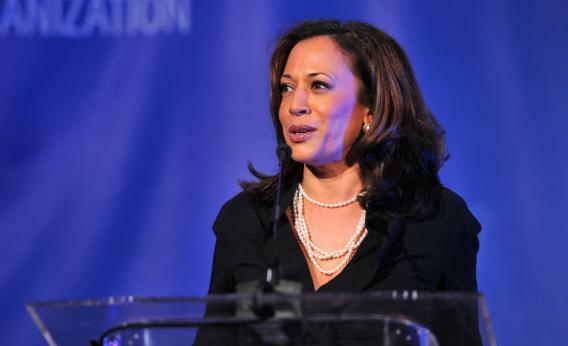 LOS ANGELES, CA - JANUARY 14: Attorney General of California Kamala Harris speaks onstage at the Cinema For Peace event benefitting J/P Haitian Relief Organization in Los Angeles held at Montage Hotel on January 14, 2012 in Los Angeles, California. A long-awaited legal settlement between major American banks, federal regulators, and state attorneys-general was announced overnight with official details to be coming out this morning. The key to breaking the logjam was getting Kamala Harris of California and Eric Schneiderman of New York on board, as those are two gigantic blue states with Democratic AGs who’d been inclined to push for tough measures. But what’s actually going on here? 1. The Background: As you know the world of high finance saw significant “innovation” during the aughts in the field of packaging and reslicing mortgages to turn them into highly rated tradeable securities. But the underlying world of real estate law was not similarly innovative. One key premise of the mortgage lending business is that the homeowner’s loan is backed by a hard asset—a house—that the lender can repossess. But in practice, securitization was proceding without regard to the fact that in practice it wouldn’t be feasible to carry out large scale foreclosures given the enormous amount of documentation that would be legally required to act upon sliced and diced mortgages. During the boom this didn’t seem like a big deal to the banks because the whole premise of the financial activity was that a prolonged nationwide housing slump was impossible. But it turned out not to be impossible so they had to try to go through with mass foreclosures, and rather than face up the bad corner they’d painted themselves into they turned to robosigning, misdating of documents, and other fraudulent and semi-fraudulent practices to get through the backload. Over time this ended up morphing from a specific legal issue into a potentially important policy lever to deliver housing policy reforms that couldn’t otherwise get through congress. 2. The Settlement Goes Small: I don’t want to be the kind of guy who sniffs at a $26 billion settlement, but the reality is that’s a relatively small amount of money. It’s small relative to the $250 billion (nominal) tobacco settlement from the late 1990s. Some federal officials say the real number is closer to $39 billion, but even if so that’s a relatively small amount. Certainly it’s small relative to the $700 billion in total underwater mortgage debt outstanding in the United States.In exchange for accepting relatively small amounts of money, the holdout Attorneys-General kept the scope of the legal settlement relatively small. Schneiderman is pursuing a seperate lawsuit against MERS which banks have been relying on in the foreclosure process, and that hasn’t been folded in to the big settlement. Kamala Harris has preserved her right (and CALPERS’ right) to undertake separate litigation under the California False Claims Act. Martha Coakley out of Massachusetts also has some other litigation that’s staying open. Private rights of action about foreclosure fraud remain intact. So rather than settling the whole thing, the banks have settled some large piece of the thing. The best news for them, legally speaking, is that this cuts off some further lines of investigation. Typically when you see this much smoke, you naturally wonder if there’s fire, but a settlement will make it difficult to ever fully know the facts. 3. Homeowners Will Get Some Money: The bottom line is that a range of struggling homeowners should have a few thousand dollars of help coming their way either in the form of direct settlement checks, principle modifications, or enhanced ability to refinance. This is a drop in the bucket compared to the total quantity of lost wealth, but in practical terms thousands of dollars today can be worth a lot more to a family than the hope that years of highly politicized litigation will pay off bigger in the future. 4. The Obama Administration Got What It Wanted: As we know, the Obama administration puts a great deal of emphasis on “credit channel” theories of financial crisis and recovery. Their big hope was to use the litigation as a lever to deliver some assistance to families and some improvements in foreclosure processes without threatening the basic solvency of major banks. They also want to get the cloud of legal uncertainty off from the banks’ heads so they can engage in their normal operations. As they see it, this is win-win-win for the economy. Banks will pony up money, but not more money than they can afford, and they’ll be able to operate on a forward-looking basis and maintain the flow of credit. The alternative of suing banks into insolvency and then needing to bail them out again was not an appealing alternative.